​The definition of a working musician is someone who plays, teaches, writes, arranges, and records music. As an established performing musician on the New Hampshire music scene for decades, multi-instrumentalist Charlie Jennison has done all of that—and more. Since Charlie has been known to play not only piano and all of the saxophones as well as flute, clarinet, and piccolo, but also percussion, bass, and a variety of indigenous instruments from around the world, musicians from Portland to Boston who know Charlie joke that if you handed Charlie a cheeseburger, he’d figure out how to play “Yankee Doodle” on it! For more than 30 years, Charlie worked with Hampton, New Hampshire-based jazz pianist Tommy Gallant, a teacher at the Berklee School of Music and an alumnus of Woody Herman's band, who influenced Charlie's growth as a musician and music educator. He also studied with such major jazz figures as Jerry Bergonzi, Charlie Mariano, Jerry Coker, and Ted Casher. Additionally, Charlie has shared the stage or been in the recording studio with such notable jazz musicians as Clark Terry, Dizzy Gillespie, Buddy DeFranco, Alan Dawson, and Marshal Royal and backed up live performances for other exceptional musicians such as Rosemary Clooney, Carmen Bradford, Natalie Cole, Andy Williams, Delfeayo Marsalis, jazz violinist Sara Caswell, saxophonist Grace Kelly, and singer/songwriter Jon Bon Jovi. In 1999, he released his own album of original jazz tunes, Iridescence, featuring his quartet of the same name and accompanied by bassist John Hunter, drummer Ken Clark, and pianist Jim Butka. Charlie is a versatile player who has been featured in many groups and on many recordings with, just to name a few: Devonsquare, Unu Mondo, Do’a World Music Ensemble (of which he was a member for 6 years), and Ben Baldwin & the Big Note, as well as backing up vocalists Barbara London, Kathleen Kolman and Leila Percy on their albums. 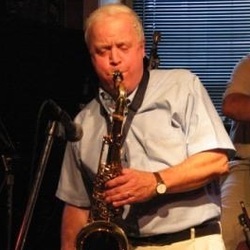 Best known for his work as a performing jazz improviser and dependable studio musician with “great ears,” he has also created musical arrangements for several big bands he plays with, including the Freese Brothers Big Band, the Capitol Center Jazz Orchestra, and the Seacoast Big Band. Over the years, Charlie has also written arrangements for such diverse musicians as Lucie Therrien, Linda Pouliot, Claire Rothrock (known for writing the song “Old Cape Cod”), Brownie MacIntosh, Dave Guard (of Kingston Trio fame), and the Shaw Brothers. His eclectic career has also included performances on recording projects for Bill Morrissey, Ed Gerhardt, Susie Burke, and David Surette. Currently teaching at Phillips Exeter Academy where he is a member of the faculty jazz quartet, Charlie also offers private instruction on classical and jazz saxophone for all levels of experience, as well as piano instruction for beginning and intermediate players. Charlie is also available for adjudicating at jazz festivals and appearing as a visiting artist/soloist/clinician with high school bands. He brings to the table years of experience gained from adjudicating at the All State Jazz Festivals in both New Hampshire and Maine, as well as for the Clark Terry Jazz Festival held annually at the University of New Hampshire. Over the course of his career, Charlie has taught private music lessons at Dartmouth College, UNH, and the University of Maine as well as courses in Music History and Jazz Improvisation at UNH and Granite State College. He has also taught at St. Paul's School, the UNH Summer Youth Music School, and the Phillips Exeter Summer Music Program. A versatile educator, whether presenting jazz performances and workshops for libraries, jazz societies, and schools throughout the New England region or coaching a jazz combo, directing a jazz band, or giving a lecture on the history of jazz on the New Hampshire Seacoast, Charlie brings his love for music to all things jazz-related. Click here for more about Charlie Jennison.